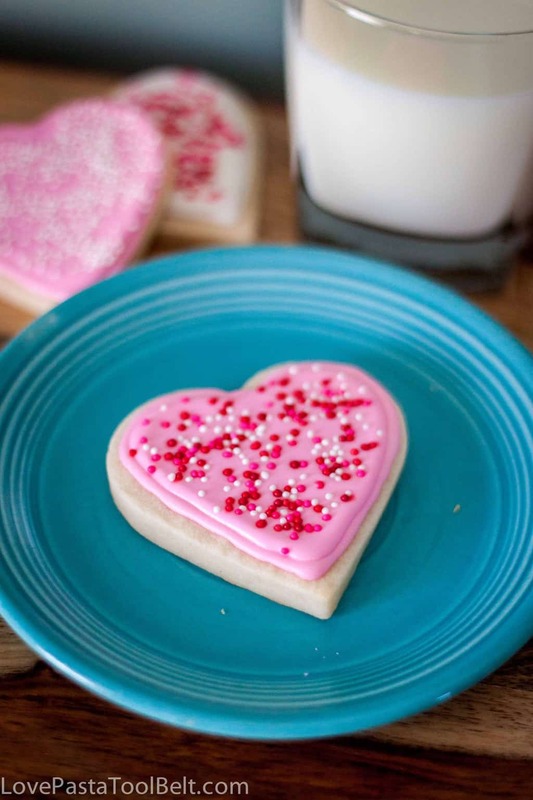 Today I have the most delicious and adorable cookies for you, Royal Icing Valentine’s Cookies. When something tastes good and looks cute that’s a win win right? My mom was in town last weekend so we made these cookies together. She is here today to tell you how it’s done! Don’t let it seem daunting, it takes some work but just look at the reward. Making cookies with royal icing is a multi-step process, something that I usually do over a period of several days. This particular Sunday afternoon, I was able to complete the process in one day! I got this cookie recipe from Annie’s Eats. It is called Ella White Sugar Cookies. I like it because the cookies are nice and dense. 1. Cream the butter, then gradually add the powdered sugar. Blend in egg, almond extract, vanilla, salt and flour. 2. The recipe says to chill the dough until firm, but instead I divided the dough into three balls and rolled each ball out to 1/4 inch thickness between two sheets of wax paper. I then stacked the three discs of dough sandwiched between the wax paper in the refrigerator to chill. I find this to be easier than chilling the dough and rolling out on a floured surface. 3. 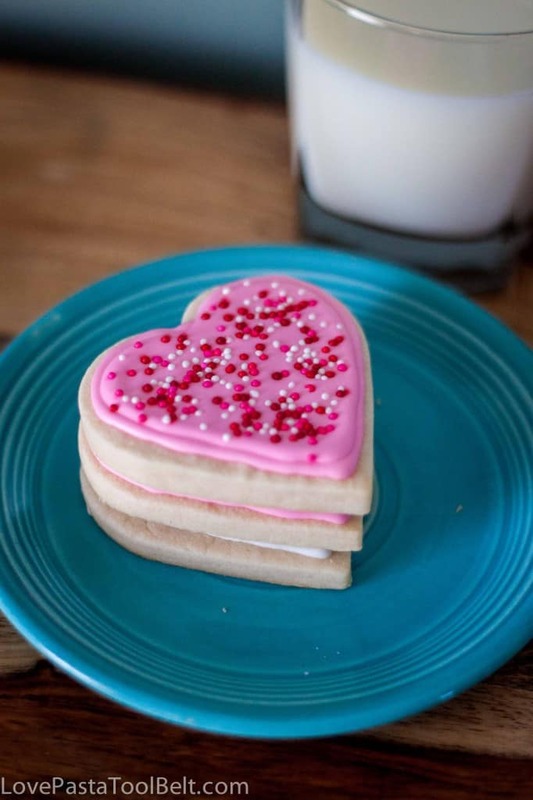 Once the dough is chilled for a few minutes, it is very easy to cut out with the heart cookie cutter and lift with a spatula onto a cookie sheet (I used parchment paper on the cookie sheets.) 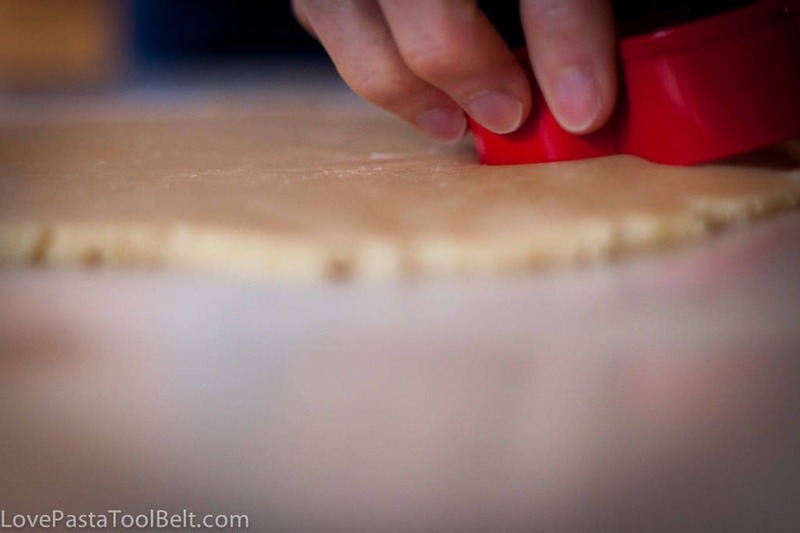 Reroll the scraps of dough and roll out between wax paper again, chilling again if necessary before cutting shapes. 4. Bake at 375 for 8-10 minutes (I did 8 minutes – you do not want the cookies to brown). Frost and decorate when cool. This made 25 cookies, but I might have snacked on the dough just a little! While the cookies were cooling I made the Royal Icing. This recipe made plenty of icing for the above batch of cookies. Most recipes for Royal Icing say to use a stand mixer with paddle attachment but I don’t have that and mine seems to work fine. 1. Combine ingredients and mix on low speed until the icing has a matte appearance, about 7 minutes. Then add water a little at time and stir by hand until the icing is a good consistency for piping. 1. To pipe the cookies, I used pastry bags with a #2 tip. I put a small amount of the white in one bag and a small amount of pink in another ( at this point I wasn’t planning to use the purple), and kept the rest of it covered in the bowls. When a pastry bag is filled and not in use, I clip off the bag end and stick the tip end in a small amount of warm water in a glass so that it doesn’t harden. I use the little Pampered Chef clips for this because I have a lot of them, but you could use a clothespin or chip clip. 2. With the pastry bag of white icing I carefully piped an edge around some of the hearts. Then I put the white bag in the water and piped around the rest of the cookies with the pink icing. At this point I was finished with this icing because I didn’t plan to pipe any more, but you could save these bags (with one end clipped and the other in the water) to pipe decoration on the cookies after the flooding icing dries. 3. Allow about an hour for the piped icing to dry. 1. 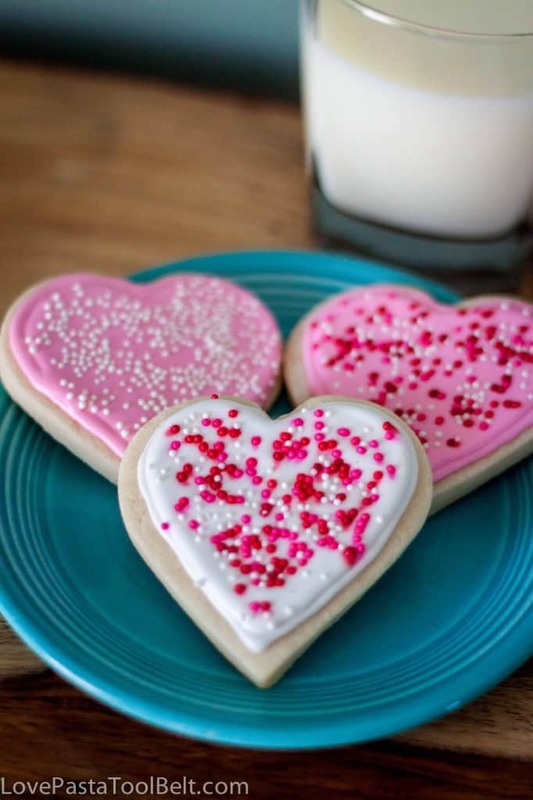 Once the piped edging has dried, you are ready to fill in the hearts by flooding the cookies with thinned icing. I added a little water at a time to each bowl until the icing dripped easily off the spoon. Then I poured the icing into a squeeze bottle. I then squeezed icing onto the center of the heart and used a knife to spread it to the piped edges. I usually use a toothpick for this but we didn’t have any available and I actually think using the knife was easier and quicker. 2. At this point it was nice to have someone helping me because we were adding various sprinkles to the cookies and this has to be done immediately, before the icing hardens. Having someone else do the sprinkles while I continued to flood the remaining cookies made the process much easier. As I mentioned before, you could also let the icing thoroughly harden ( I usually do this overnight) and then go back to your piping bags to add detail to the cookies. One cute idea I have seen is to ice the hearts in various pastel colors and then pipe words onto them like those candy conversation hearts. If you are going to do this, you would want to change to a #1 tip for the writing. It takes some practice to get the hang of royal icing and I haven’t been doing it very long, but it is getting much easier. 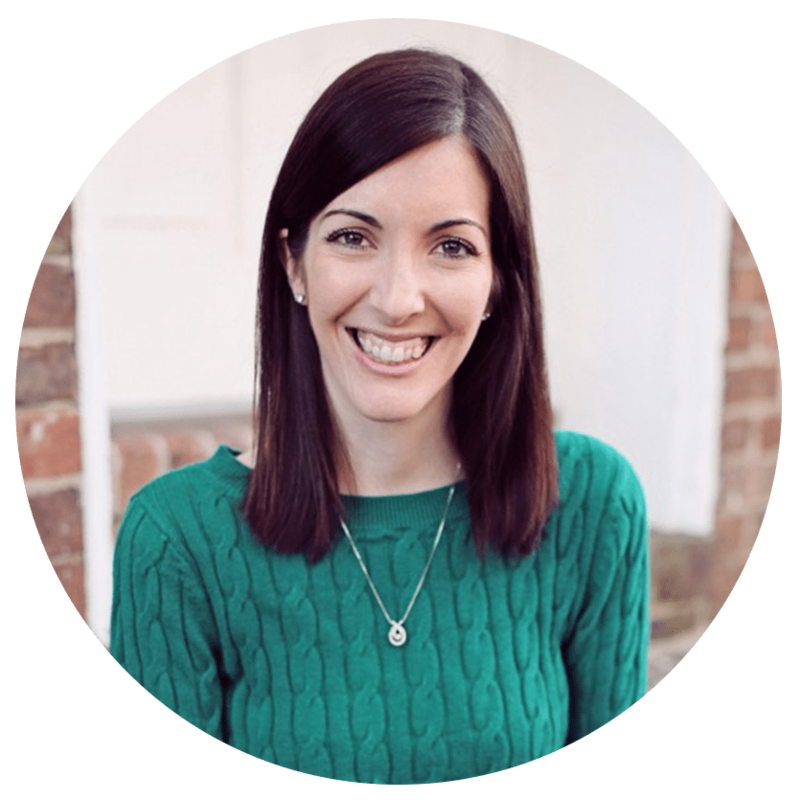 For a very detailed step by step guide to get me started, I found Annie’s Eats to be very helpful. Thank you to my mom for sharing this wonderful recipe with everyone. I hope you all enjoy it. Do you have a favorite stand by recipe for beautiful holiday cookies? A lady at my church at home used to make the best sugar cookies–I have the recipe on my old computer somewhere, and I’ve been meaning to try my hand at it for years. I’m definitely going to have to try to royal icing recipe. I have a sugar cookie mix that came in a Christmas gift basket, and I’ve meaning to make them, just been looking for the perfect icing recipe to try–this post was perfect timing! 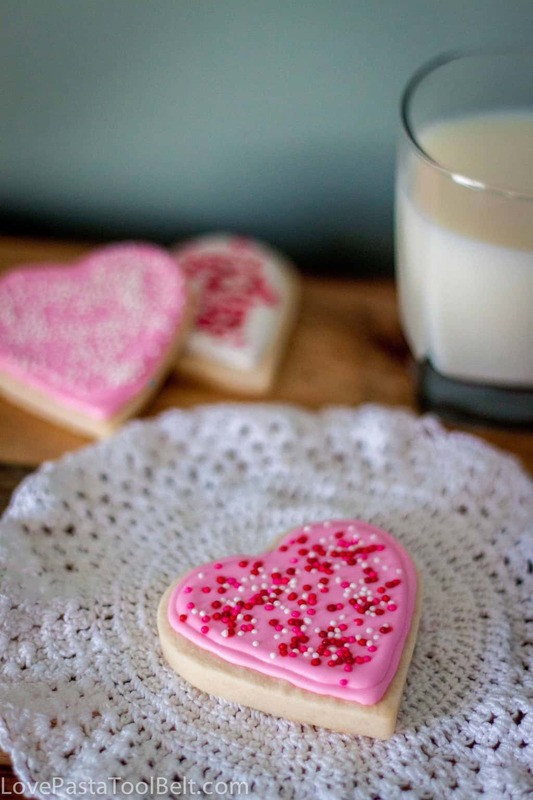 Such pretty cookies, they turned out beautifully Emily:) Great recipe and perfect for Valentine’s Day, thanks for sharing! I love cookies like that, soooo good! I had to check with my mom but she said that you have to go to Hobby Lobby or Joann’s for the meringue powder. You wouldn’t find it at a grocery store. I hope you enjoy making these! Thank you Jamie! We really enjoyed making them! 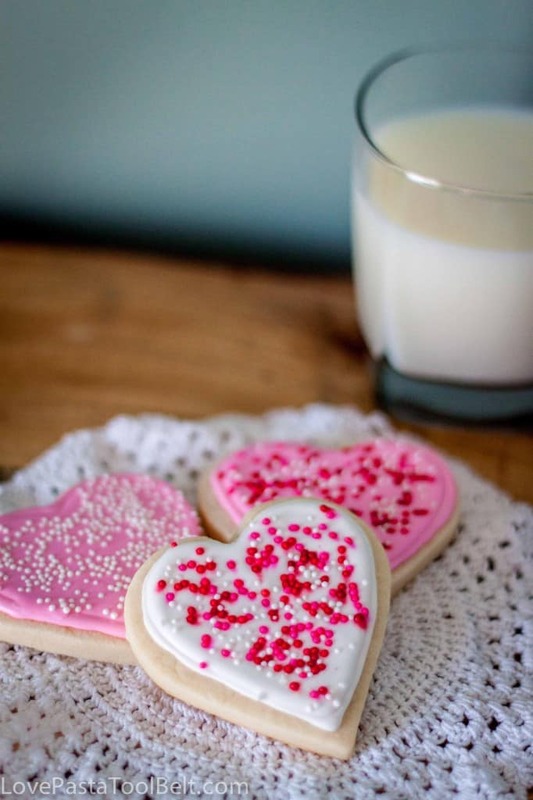 I love sugar cookies and these are decorated very cute! Thanks for sharing this with us at our Marvelous Monday Party! Pinning! Oh those look super yummy! I must try!! Thank you!! I’ve been working on my photography so that means a lot! The cookies are as good as they look! Yum – thanks for the recipes. This recipe is going to be the first thing I make in my brand spanking new Kitchen Aid Artisan Mixer. Perfect little gift for hubby on Valentine’s Day. Glad I saw your cookies over at the Pin Junkie party! I hope y’all enjoy them! Hi Emily, thanks so much for sharing your delicious recipe and instructions. I’ve pinned and will be sharing this on my FB page tomorrow. Thanks for sharing with Foodie Friends Friday Valentines’ Sweet Treat Party this week. Thank you so much Joanne! Glad you enjoyed the post! I love when people decorate cookies for a special occasion. They always look so pretty! These cookies look great and are just the type of cookie I like to make for the children in my life. Children love cookies like this so much more than a slice of cake or pie. It’s because you’ve made them special by cutting them in a shape and decorating them! Great idea! Yes they are so fun and festive! These looks fantastic…and pretty! Yummy. G’day! HOW cute! GREAT photos! I so want to try Royal Icing but I can’t find the meringue powder here =(. Made some heart shaped valentine cookies trying frosting but the coloring didn’t turn out right so the photos didn’t turn out right either. I couldn’t post it but at least I can say they were YUMMMYYYYY. LOL I’m not sure I let anybody even try them I was eating them like crazy LOL. As soon as I can get some meringue powder I’ll try your recipe! Pinning! I hope you can get some and try these out! Thank you for pinning! These are just beautiful! Thanks for sharing on Foodie Friends Friday! So cute! Thanks for sharing on Whatever Wednesday at Thank You Honey! Thank you for coming by Sarah! I’ve always been hesitant to try Royal Icing, but you make it look so easy…And the cookies look perfectly delicious! I hope you enjoy them! It takes a little time but the result is beautiful. Thank you so much for featuring the cookies and for hosting!